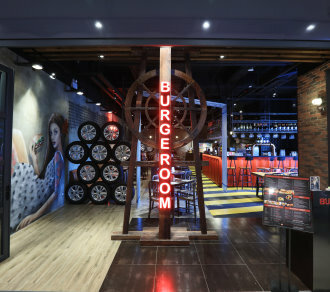 BurgeRoom was founded in 2007. Recently, it was awarded Prestigious Restaurant (2016), Best Western Restaurant (2016), Best Restaurant in Wanchai, Causeway Bay (2016). It has been well-known for making the ordinary extraordinary. It gives "burger" a new name by introducing new ideas to the menu, such as the signature Foie Gras Burger, Soft Shell Crab Burger, Portobello Mushroom Burger cud Lobster Burger. Its success has been well-recognized. The eye-catching decoration is always characteristic of the shop. The highlight of Tsim Sha Tsui shop however, is the beautiful graffiti by the famous Spanish graffiti artist, Victoriano.